Brazilian Cherry and Pecan wood inlay. 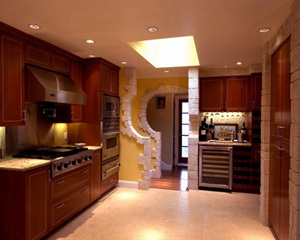 This is the kitchen among many of my designs that Avaliving selected to feature this week. The area where the refrigerator used to be became a space for wines and an area where to taste cheeses, slicing prosciutto, basically an area where to prepare aperitif. The tall floor to ceiling cabinet hosts sixty bottles of red wines on roll-out shelves. Clients did not really require a temperature controlled room for the red wines, as they use them every day with friends and family visiting often. 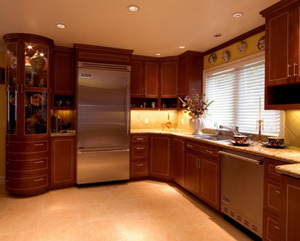 A small refrigerator for white wines under the granite counter top was necessary to free the space in the family refrigerator, already bursting with food serving two growing boys and the family entertainments. I strategically placed this wine area between the new door to the dining room and the chef pantry. The supplies such as crackers, toothpicks, dried nuts, fruits and stuff for aperitif are now kept close by the wines and the wines have easy access to the dining area with a new passageway, saving the owner a trip around the wall. Planning a well-functioning kitchen is not just about designing cabinetry to stuff the walls, but it’s about letting all the spaces communicating with each others and their function. The “anticato” tile floor I added really suited the clients who are Italians and like me, they don’t care that the floor or counters show a little ring of wines here and there, the signs of a good time and the sign of a lived home. Natural stones will leave with us and will become beautiful when they start showing the sign of life, just like our stones in Europe are living through centuries and everyone admires their beauty. 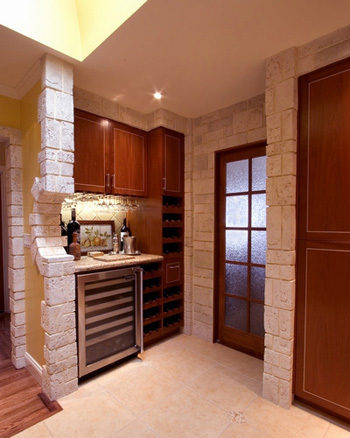 This wine area was part of the entire kitchen remodeling with family and dining rooms included. There you have it, another example of how I can change a kitchen from an unattractive 1970 cooking area into a contemporary dining, cooking and entertainment showcase. Thanks to Avaliving featuring it this week, more people will have the chance to admire it.